Posted on July 25, 2012 at 9:45 pm. It’s been a bit quiet around BEL15VER headquarters this summer since Tebow got traded. However, we do have a few notable things to share. After the trade, we decided to continue the BEL15VER campaign with a New York twist. We updated the logo in a style similar to the Jets font and we now offer an official Jets BEL15VER tee in forest green. Let us know what you think about the new design! But, the more exciting part for us was being able to reflect on what happened in January and the amazing support we received from Broncos fans and Tebow supporters around the world. More than 9,000 fans joined us on facebook in one thrilling week and hundreds of fans from 43 states ordered 1,123 t-shirts. It was a whirlwind of activity and once things slowed down a bit, we were able to look back, take inventory and figure out just how much we could donate to the Tim Tebow Foundation. We always said we’d give 15%, but once we ran the numbers the sum wasn’t all that impressive. So we decided to increase the percentage a bit to reach an even $1,500 (for obvious symbolic reasons). We wrote a cover letter, packed up a handful of BEL15VER tees (including the new Jets tee) and sent them off along with the check to the foundation in Florida. Then, a few weeks later, we got confirmation that they indeed received our package. It feels good to give back and share our success story with the people and person that made our campaign possible. Thanks again to Bronco Nation and the businesses that supported the campaign including Woodley’s Furniture, InterCall and Impact Sports. Looking forward, we’re anxious to see how the 2012 NFL season unfolds as well as how much we can raise with the BEL15VER brand. 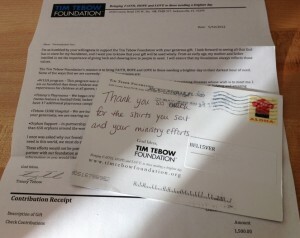 We suspect Tebow will continue to do great things on the field and even more impactful things off the field. After all, that’s why we’re BEL15VERS in the first place.